A sneaky peek of just some of what is in the December 2018 issue – OUT NOW! A few weeks ago, Wiyaala performed the theme song at the launch of the Women’s African Cup Of Nations football tournament, in a stadium in her home country of Ghana. She was a natural choice for the role, since, apart from being a bit of demon midfielder in her youth, the Afro-pop singer is a huge star not only in her own country, but more widely across the continent of Africa, where she has won several awards and scored an array of hits during the last five years. Her 2013 single Rock My Body, for instance, won her two prizes at the 2014 first edition of the All Africa Music Awards, as well as the title as Most Promising Artist in Africa and Revelation of The African Continent. Her ‘official’ debut album, the eponymously titled Wiyaala, was nominated for Album Of The Year at the Vodafone Ghana Music Awards in 2015 and the All Africa Music Awards of the same year. 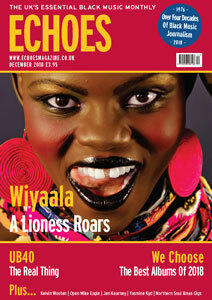 She also headlined the 15th London African Music Festival in London. Whenever you speak to a musician that’s worked with maverick producer – & now artist – Kelvin Wooten, a familiar theme crops up. Open Mike Eagle’s latest EP is deceptively titled What Happens When I Try To Relax. I say ‘deceptively titled’, because, as it turns out, the Chicago-born, Los Angeles-based rapper isn’t good at taking things easy. He likes to stay busy. UB40 are about to celebrate their 40th anniversary with an impressive new album, accompanying dub and remix sets and a 40-date tour, starting in March next year, that will include Duncan Campbell’s 500th show as the band’s “new” lead singer. It’s no secret that there are currently two UB40s and so here’s a quick summary of what’s brought us to this point.